Mars rover Curiosity, the centerpiece of NASA's Mars Science Laboratory mission, is coming together for extensive testing prior to its late 2011 launch. This image taken June 29, 2010, shows the rover with the mobility system — wheels and suspension — in place after installation on June 28 and 29. NASA's nextMars rover just got a new set of wheels and an innovative suspensionsystem inpreparation for its journey to the red planet. 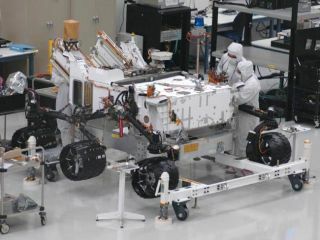 The MarsScience Laboratory Curiosity,a robot car is scheduled to launch in 2011 and reach Mars soil inAugust 2012. Eachof its six new wheels is about 20 inches (about half a meter) indiameter. Theambitious rover is designed to collect samples and conduct tests onrocks acrossthe Martian surface in order to dissect the planet's geological history. Unlike pastrovers, which set down on Mars with landers, the new rover's design isbuilt toallow Curiosityto touch down on the Martian surface directly. Though itpossesses the samenumber of wheels (six) and the rocker-bogie suspension system ofprevious NASAMars rovers like Spirit, Opportunity and Sojourner, Curiosity'smobility systemis uniquely capable of absorbing the shock of a rocket-powered landing. "Inthis case the first thing to touch the ground is not the petal of thelanderbut the wheels of the rover itself," said GuyWebster, a spokesperson for NASA's Jet PropulsionLaboratory (JPL) inPasadena, Calif., which is building the rover. "It isthe first time we've done this before, but we do intend to use it inthe futureas well," Curiosity mission leader Michael Watkins of JPL toldSPACE.com. "It'sa more mass-efficient way to land. We don't have to carry a separateheavypallet below the rover, and it also weighs less." The lowerpackaging mass frees up more room for the rover and its scienceequipment. Withoutits novel landing system, the 1,980 pounds (900 kg) rover would havehad to setaside a few hundred kilograms of its payload to house the airbag andlandingplatform, Watkins said. Curiosity's sciencegear includes a laser that will be used to vaporize rocksfrom a distanceand an instrument that can test for organic compounds that could offerhopethat life may have once existed on the planet.